The automotive industry constitutes the backbone of the world's economy and employs the greatest share of the working population. It has been contributing to the growth of modern society by satisfying everyday mobility. However, it has been accused of affecting the environment and public health, and thus finding new methods of propulsion for automotives is currently a subject of intense debate. In this volume, the concept of sustainable development has been correlated with the main theoretical framework of production analysis and managerial economics, that is: manufacturing and architecture theories; theory of comparative advantage of design location; design driven and design thinking theories; concepts-knowledge models; rule-based and innovative design regimes; path dependency theory; literature on breakthrough and disruptive innovations; studies on technology competition; reasoned action and planned behavior theories; institutional theoretical approaches; firm growth theories; smart grid paradigm; business model innovation; definition of scenarios through analytic hierarchy process models and consumer framing. 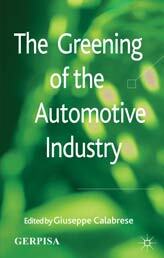 The Greening of the Automobile Industry is one of the products research program "Sustainable Development and Automotive Industry", run between 2007-2010 by GERPISA (the Permanent Group for the Study of and Research into the Automobile Industry and its Employees).